Here is just a sample of the hundreds of new and rebuilt accordions that we have in stock. It is usually best to call in to discuss your purchase. Our expert sales staff is glad to help you place an order for the right features and the right accordion. Many people ask for used accordions. We take used accordions that are worthy of restoration and expertly rebuild them. Many rebuilt models can easily pass for new. These represent the greatest value in sound per dollar. If you call us, we can usually recommend a few specific instruments that are ready to sell with the exact features you would like. 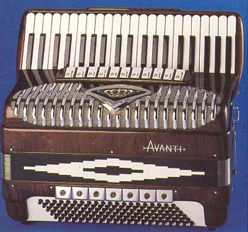 If you fill in the accordion questionnaire, we can figure out the exact features you want. Need help on Accordion terms click here. 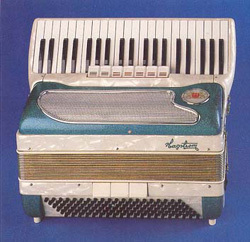 This is a photo of a typical Excelsior MIDI accordion. 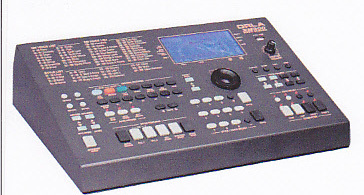 Excelsior is one of the premiere MIDI instruments in the world today. 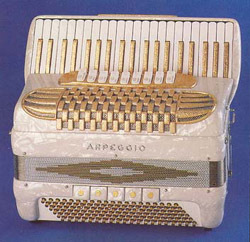 Each accordion and its electronics are designed and built for each other. This is not a kit. It was designed for their accordion. This outfit has programmable MIDI features, a powerful memory, and many channels. It is only one of a variety of high quality accordions that Excelsior offers. You choose the accordion and you choose which MIDI you want. 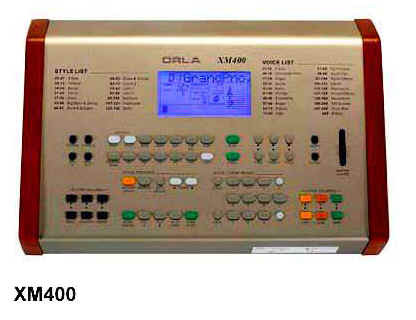 The newest ORLA arranger modules, the XM300 and the XM500 have arrived. They offer stunningly realistic sounds and advanced performance features while being light-weight, compact, and easy to use. You can sound like a professional the very first time you play! The XM300 and XM500 use a new generation of technology and still retain the warmth and depth of tone which has long been associated with ORLA products. It easily sets up to be used with MIDI accordions. 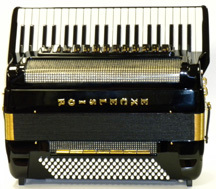 The ORLA XM400 is custom made for the accordion and makes it as easy as possible to use. The XM400 has more rhythm styles than the XM900, but the number of sounds at one time is less. The XM400 has 130 styles plus 2 variations. The computer disc drive affords you access to unlimited songs on MIDI files or you can make your own MIDI files. XM900 VIRTUOSO DELUXE The ORLA XM900 VIRTUOSO DELUXE is the latest in a series of fine modules. These are generally found to be the most intuitive to use. They make sense. This one allows the player to choose up to four layers of best quality up-to-date sounds for the treble and up to ninety permanent rhythm styles, plus 3 variations of each. There are also sixteen over-writeable custom rhythm styles. Those styles provide automatic walking bass and full accompaniment so you can easily play thousands of songs. The computer disc drive affords you access to thousands of specific songs on MIDI files and few rules on moving files between your computer and this module. 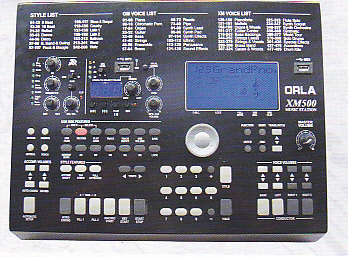 Other Orla modules are the ORLA XM200, the ORLA XM600, and the ORLA XM800. Don't buy Polytone Amps direct from polytone! They take your money and never send you the amplifers! We prepaid for eleven amps from them in April 2011. They have sent two! We are not the only ones that they have done this to. Dealers and individuals beware! Mr. Tommy Gumina may have been an talented accordion player but his company is defrauding people of their money. Diana Roche is the one who tells lies. No one ever answers their phone once they have your money. Check them out on the California Better Business Bureau. Don't write checks to Thomas Engineering. If they resolve this problem we will let you know. Here are two examples of diatonic accordions. 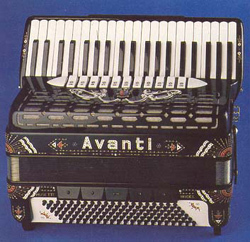 The Avanti has 33 treble keys arranged in three rows with eight treble switches and twelve bass buttons. The Excelsior has two rows of 21 treble keys and eight bass buttons. 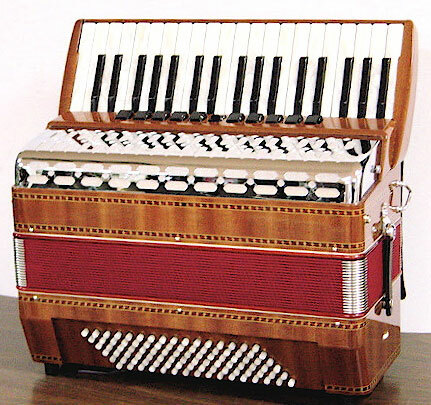 One row button accordions typically have ten treble buttons and four bass buttons or four stops. One row diatonic accordions play in one key which is usually C. Two row button accordions play in two keys-usual key combinations are GC, CF, AD, DG, and BC. 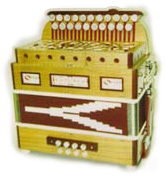 Three row diatonic accordions are offered in GCF, ADG, EAD, FbBbEb, and BbEbAb. 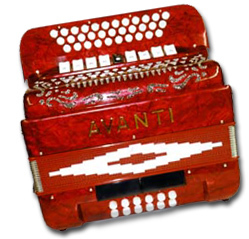 This Avanti is one of the many diatonic accordions that we carry. This Avanti three row model uses high quality T.A.M. reeds. It has a luxurious, powerful, resonant frame and has a superlative tone. It comes standard with the most powerful configuration of four sets of treble reeds for maximum power and variety of tones. It comes in the standard keys or can be custom-ordered with features such as multiple key scales, eagle decoration, rhinestones, mics or even MIDI. It has 33 treble buttons and 12 bass buttons, 9 treble and 2 bass switches. We have it in black or red with a stepped or a flat treble keyboard. It comes with straps and a deluxe hard case. We also carry a red two row Irish model in BC. Call for details. This small diatonic accordion is especially convenient to use. Beautiful clear woods are used to create a look AND a feel. These instruments are still high in quality but not expensive. Here are three examples of Excelsior Piano Accordions. There are many choices when choosing an accordion. size, color, number of reeds, quality of reeds, sound you like, etc. 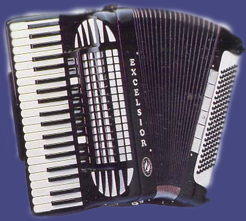 Many Excelsior accordions look alike, but their features may be different. We don't just sell by a model number. 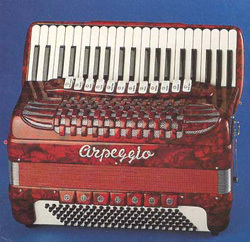 After talking to our customer, we can recommend an accordion that will suit his/her preferences. We have many Excelsior accordions in stock or if you have a dream accordion, we can custom order it for you. One close up look at these accordions tells the whole story: This series represents a totally different look, sound, design, and feel. 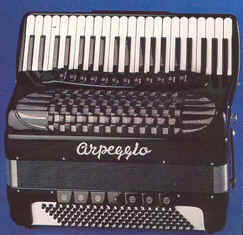 This boxy design makes the accordion lighter, brighter in tone, and more compact. The right hand is loaded with double musette and a powerful bassoon reed. 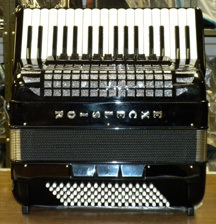 These instruments can play any type of music but the look given from the gleaming rosewood finish, lovely pearl keys, sparkling black chrome grill, and fabulous detail woodwork make it the accordion line for those Alpine waltzes and polkas. Call for details. 3/5 SETS OF REEDS. 120 BASS. MEDIUM SIZE 18" KEYBOARD. INSTRUMENTS OF THIS FINE QUALITY ARE USUALLY ONLY AVAILABLE IN THE FULL SIZES. THE PATENTED MUTE AND HAND MADE REEDS IN A VERY HIGHLY ACOUSTICAL FRAME GIVE THESE INSTRUMENTS A SUPERB MELLOW TONE. THE SILENT BASS MACHINE ALLOWS FOR HIGH QUALITY AMPLIFICATION WITHOUT NOISE. A VERY FINE, VERY COMPACT UNIT. INCLUDES STRAPS AND CASE. THE WORLD'S FINEST ACCORDION. THIS IS A COMPLETELY HAND MADE INSTRUMENT. HARDWOOD SHAPED FRAME * EFFECTIVE DOUBLE OPENING MUTE (MADE WITH GUITAR QUALITY WOOD) THE MUTE IS PROGRAMMED BY THE TREBLE SWITCHES. THIS GIVES IT A TONE CHAMBER TYPE QUALITY. 120 BASS WITH DOUBLE FELT (NO CLICKS). THE FASTEST COMPETITION KEYBOARD ACTION. THERE ARE 12 TREBLE AND 7 BASS SWITCHES PLUS A KEYBOARD MASTER SHIFT. A FULL SIZE (REGULATION) 19 1/4" KEYBOARD. NOTE THE BEAUTIFUL HAND STRUNG GRILL WORKS. ALL STAINLESS STEEL BELLOW CORNERS. BLACK IRISH LINEN BELLOWS FOR HIGH COMPRESSION. 4/5 SETS OF HAND MADE REEDS. AVAILABLE IN DRY OR MUSETTE TUNING. WITH OR WITHOUT STEREO MICS. INCLUDES STRAPS AND CASE. 5/5 SETS OF HANDMADE REEDS. 120 BASS. DOUBLE TONE CHAMBER AND BEAUTIFUL GUITAR BODY STYLE MUTE. TOP PROFESSIONAL QUALITY. AMERICAN WALNUT SUPER FAST KEYBOARD. HIGHLY RESONANT. THIS INSTRUMENT MUST BE HEARD AND FELT TO BE APPRECIATED. THE MATERIALS AND WORKMANSHIP ARE UNSURPASSED. THERE ARE MANY FEATURES TOO NUMEROUS TO MENTION. THE INCREDIBLY FAST KEYBOARD AND LUXURIOUS TONE CANNOT BE ADEQUATELY DESCRIBED. INCLUDES STRAPS AND CASE. ALSO AVAILABLE WITH STEREO MICROPHONES. 4/5 REED. 120 BASS. FULL SIZE KEYBOARD. THIS INSTRUMENT HAS AN EXTREMELY SPARKLING AUTHENTIC FRENCH MUSETTE TUNING. THE FINE CRAFTSMANSHIP OF 3 GENERATIONS HAS DEVELOPED AN EXTREMELY FAST KEYBOARD IN A STRONG AND SLIM FRAME. THE ARTESIAN DESIGN AND RHINESTONES HAVE BEEN SET FLUSH WITH THE SURFACE. THIS UNIT IS IDEAL FOR STROLLING. AVAILABLE IN BLACK. CALL FOR DELIVERY TIMES. INCLUDES STRAPS AND CASE. AVAILABLE WITHOUT RHINESTONES. ALSO AVAILABLE WITH MIDI. MADE IN ITALY. THIS IS A FULLY HAND MADE INSTRUMENT OF THE FINEST MATERIALS. A TREMENDOUS SELECTION OF DIFFERENT MUSETTE TYPES. THE PATENTED MUTE DOUBLES THE TONAL VARIETY. ALL REEDS ARE HAND MADE AND SET IN DURALUMINUM PLATES. THIS IS A FULL SIZE 19 1/4" KEYBOARD WITH 120 BASSES. THERE ARE 11 TREBLE SHIFTS INCLUDING 2 FOR THE MUTE. THESE PROVIDE A FULL SPECTRUM OF THE MUSETTE SOUNDS AND MANY DRY SOUNDS PLUS MUTE OPEN AND CLOSED. THE LEFT HAND HAS 7 REED SHIFTS. THIS PROFESSIONAL QUALITY INSTRUMENT IS IDEAL FOR AMPLIFICATION. STANDARD COLOR IS JET BLACK. INCLUDES STRAPS AND CASE. The world's most famous accordion has two models that have endured the test of time. Both the standard and the super models represent terrific quality at an excellent price. Both are considered professional quality. The super has a double tone chamber. Both are true Excelsiors. These would not have been considered "Accordiana" or "Excelsiola". Remember, these are both top professional models, not student instruments. Each has a hardwood frame, full 120 bass with felt (no clicks), fast keyboard action, full 19 1/4" size, and 4/5 sets of fine reeds with musette. Other Excelsior models are available with less reeds, less keys and basses, other features, colors, RHINESTONE DECORATIONS, etc. 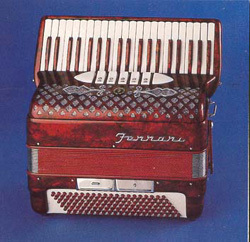 We carry a complete line of these fine Italian accordions. Most look similar to this one pictured but just have other features. We are the direct importer so we can offer you the best prices. Call (732) 727-7715 for up to date prices. 12 BASS. 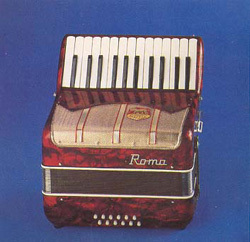 BEGINNERS ACCORDION. 2/4 SETS OF REEDS. THIS IS THE IDEAL SIZE AND WEIGHT FOR SMALL CHILDREN TO HANDLE. THE INSTRUMENT HAS A NICE MUSETTE SOUND. ADULTS FIND THIS SIZE VERY NICE TO TAKE ALONG ON PICNICS OR OTHER OUTINGS. AVAILABLE IN RED PERLOID. INCLUDES STRAPS AND CASE. SIMILAR MODELS FOR ADULTS ARE AVAILABLE IN 48 BASS WHICH HAVE COMPLETE BASS, A VARIETY OF SOUNDS AND COMPACT SIZE. (SEE BRAVO 48 BASS BELOW) CALL FOR PRICES. 2/4 SETS OF REEDS. 120 BASS. MADE IN ITALY. 5 TREBLE AND 2 BASS SWITCHES. IT IS LIGHTWEIGHT AT ABOUT 17 POUNDS. AVAILABLE IN A 17" STUDENT SIZE OR A 15 1/2" MIDGET SIZE. THIS IS AN EASY PLAYING ACCORDION THAT CAN LAST THROUGH SEVERAL STUDENTS AND STILL PLAY AS GOOD AS NEW. AVAILABLE IN JET BLACK OR RED PERLOID. INCLUDES STRAPS AND CASE. SIMILAR 2/4 REED STUDENT SIZE REBUILT ACCORDIONS ARE AVAILABLE . or call (732)727-7715 for more information. please fill in the accordion questionnaire to indicate your preferences. You may want to order our "Demo" video tape to give you more information about our accordions. Interested in accordion music? Please click here.